For more information on costs for available permits, petitions, inspections and other city fee costs, visit the current Fee Schedule Here. Conveniently Pay Your Water Bill Online – Coming Soon! 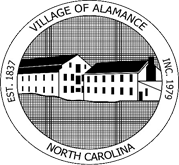 We are excited to announce that the Village of Alamance will soon be offering a new method for viewing and paying water/sewer bills online. Please sign up if you would like to be notified when our new payment portal is available.